Lilies (genus Lilium) are loved by gardeners everywhere. These big, bright, and dependable flowers have an elegance that’s unsurpassed. If you plant several different varieties, you can have blooms all summer long. Many gardeners don’t realize that there are several different types of Lilies, and each blooms at a different time during the summer. By planting a few bulbs of each kind, you can have Lilies in bloom literally all summer long. Asiatic Lilies (Asiatic hybrids) start the season in early to midsummer. Most have upward-facing flowers and all are hardy in zones 4 to 9. The next Lilies to flower are the Martagons (Lilium martagon) also known as Turk’s Cap Lilies. Growing up to 4 feet (1.2 m) tall, they have dainty, 3-inch (7.5 cm) flowers with petals that curve backward (recurved), and up to 20 blooms on each stem. All Turk’s Cap Lilies are hardy in zones 3 to 9. Midsummer brings the flowers of Trumpet Lilies. These elegant bloomers are named for their trumpet-shaped flowers, and all are hardy in zones 5 to 9. 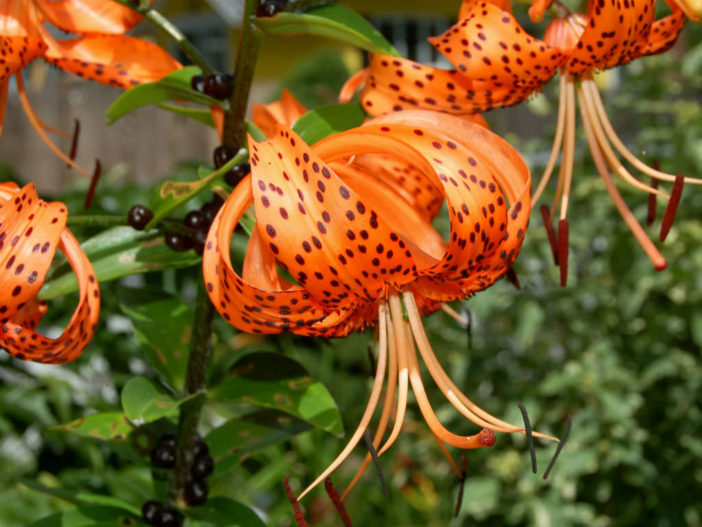 Tiger Lilies (Lilium lancifolium) stand up to 4 feet (1.2 m) tall and have large, freckled, pendulous blooms with recurved petals. Tiger Lilies are very hardy (zones 3 to 9) and will multiply to form large clumps over the years. They are happy almost anywhere, producing a dozen or more flowers on each stem. Colors are typically in the warm range, from golden yellow through orange and into reds. Rubrum Lilies (Lilium speciosum var. rubrum) resemble the Tiger Lilies because they too have recurved petals. However, the color range is cool—from white to deep pink — and the blooms are sweetly fragrant. The season ends with a bang when the Oriental Lilies start to bloom. Intensely fragrant, with huge, flat blossoms that can be up to 10 inches (25 cm) across, Oriental Lilies are a fabulous in the garden or in a vase. Intensive breeding efforts have widened the range of colors. A new relative of the Oriental Lily is something called the Oriental Trumpet Lily, a hybrid created from Trumpet Lilies and Oriental Lilies. The result has the best qualities of its parents: upward-facing blooms and intense fragrance. Spread an organic mulch around Lilies to help keep the soil moist and cool. Use compost, well-rotted manure, or a longer-lasting mulch, such as bark mulch, wood chips or cocoa shells. As with other perennials, it’s a good idea to cover the bed over the winter with straw and/or evergreen boughs to help protect the bulbs from freeze-thaw cycles. During the flowering season, remove spent blooms, but try not to cut off more than a third of the stem, which can reduce the plant’s vigor and longevity. If you are growing Lilies strictly for indoor arrangements, consider planting them in a designated cutting garden, where you can plant fresh bulbs each year.